ISLAMABAD: An accountability court in Islamabad has sentenced former prime minister Nawaz Sharif to 10 years in jail, while his daughter Maryam Nawaz has been sentenced to seven years. Captain (retd) Safdar has been also sentenced to one year in jail. The court has also ordered to confiscate the Avenfield apartments, that were onwed by the Sharif family since 1993. Moreover, the court imposed £8 million fine on Nawaz while Maryam was slapped with a fine of £8 million. Nawaz would have to serve one additional year in jail for ‘not cooperating with NAB’. The court announced its reserved verdict at 4:40 pm. Earlier, in the morning, the court dismissed Nawaz Sharif and Maryam Nawaz’s application filed on Thursday for a seven-day delay in the announcement of the verdict in the Avenfield corruption reference in light of Begum Kulsoom Nawaz’s health. Ahead of verdict’s announcement, the district administration imposed Section 144 in the capital to discourage mass gatherings. Following the verdict, Maryam and Safdar stand disqualified from contesting the July 25 general election from Lahore and Mansehra, respectively. Nawaz Sharif, his daughter Maryam and son-in-law Captain (retd) Safdar have been appearing before the court, while Hassan and Hussain Nawaz have been declared ‘runagates’ by the court for failure to show in front of the court. 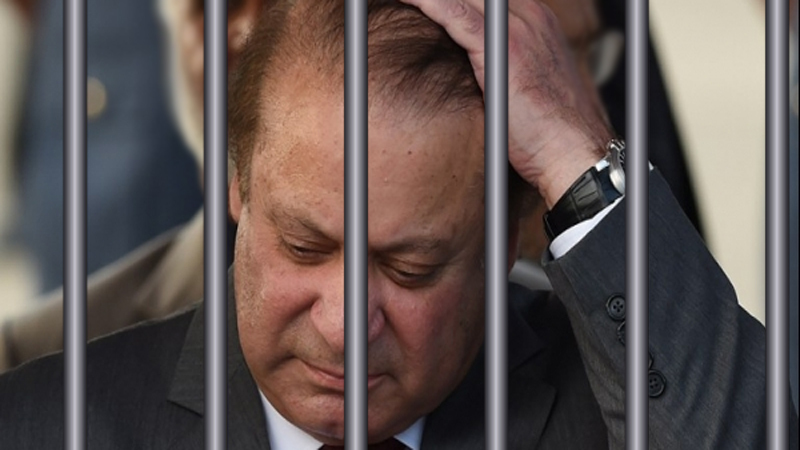 Several polticians and journalists took to twitter to comment on the Avenfield verdict that has sentenced former prime minister Nawaz Sharif and his daughter Nawaz Sharif to 10 and seven years, respectively, in jail. Pakistan Tehreek-e-Insaf (PTI) leader Jehangir Khan Tareen termed the verdict as a ‘great victory for Pakistan’. PTI Chairman Imran Khan has said all Pakistanis should offer prayer of thanks over the Avenfield case verdict. Pakistan Muslim League-Nawaz (PML-N) President Shehbaz Sharif has rejected the verdict “strongly” saying history would remember it in “black words”. Moreover, commenting on the verdict Pakistan Peoples’ Party (PPP) leader Khursheed Shah said the timing of the verdict is not good as it would benifit Nawaz Sharif. Veteran poltician Sheikh Rasheed Ahmad said Nawaz Sharif wants the people to come out on the roads to whom ‘they didn’t even provide basic facilities’.